Xbox One boasts a smooth user interface, a raft of cutting edge entertainment services and of course the innovative power of the next gen Kinect sensor. Yet when all's said and done, any console's success is largely measured by its games and especially those games which are exclusive to the system. It's still early days of course, but Xbox One is already packed with enough exclusives to make it the envy of its rivals, with the biggest range of exclusives available on any console. It's fair to say that whatever kind of games you love, there is quite literally something for everyone. Dead Rising 3 leads the pack, an amazing open-world zombie slaying sim which harnesses the Xbox One's raw power to deliver a brutal, carnage-filled and frequently hilarious zom-com. Starring as everyman Nick Ramos, you'll craft jaw-dropping weapons, build deadly custom vehicles and battle hideous zombie bosses as you struggle to escape the apocalyptic zombie infested playground of Los Perditos. For those who like their racing a little more real-world, ladies and gentlemen start your engines for Forza Motorsport 5. Superb 1080p visuals at a stunning 60 frames per second combined with a huge stable of beautiful high end motors, a range of challenging tracks and advanced Drivatar AI make this the definitive next-gen racer. If you consider yourself any kind of serious petrolhead, you seriously need this game in your life. Perhaps though, you're a fan of historical epics? Well then, step into the sandals and armour of Marius Titus, the heroic star of Ryse: Son of Rome, a bloody tale of honour and vengeance set during the high days of Imperial Rome. 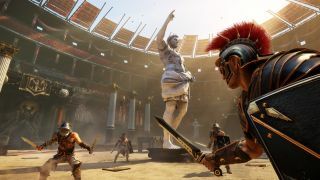 This brutal hack and slasher sees you rise through the Roman ranks to command your own legion and its stunning visuals have to be seen to be believed. Quite simply, this ranks as one of the most gorgeous looking games ever made, but don't let that distract you, it's a stone cold killer. Of course no Xbox line-up would be complete without the return of the Master Chief and this year will see with the Halo legend's next gen adventure begin on Xbox One. Little is known about the game outside of last year's mysterious, provocative E3 trailer, but after the excellent Halo 4, it's fair to say 343 Industries have the iconic Xbox warrior's future safe in its hands. Whether it's battling the Covenant or a showdown with the Prometheans, we say 'sign us up now'. Finally, one of this year's most eagerly anticipated games is also one of the year's biggest Xbox One exclusives. Made by the veterans behind the original Call of Duty series, Titanfall combines big robot action with innovative infantry combat in a futuristic sci-fi shooter extravaganza that will leave all your senses tingling. Titanfall not only looks like an amazing game in its own right, but is set to push the boundaries of the shooter genre forward in exactly the same way as the original Call of Duty did. We simply cannot wait to get our hands on this one and fortunately we don't have to, as March signals the onset of huge Titans falling from the skies. So there you have it: five massive games, five massive exclusives with enough variety and depth to challenge and entertain every kind of gamer. If you want to play the best games of 2014 there's no doubt there's only one place to be and that's on Xbox One.